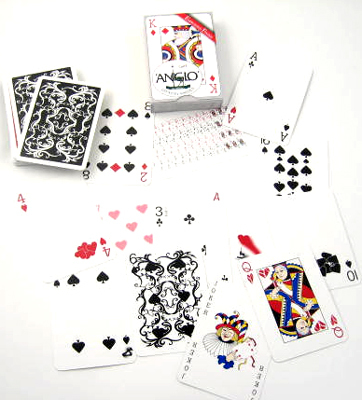 The Anglo playing cards are produced by Offason of Sweden. They are designed by Åke Arenhill, and several different editions exist. 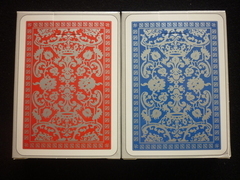 Card flourishers should notice the unusually thin borders, which makes for great-looking fans when well executed. Anglo Rug Backs were introduced at FISM WCM in 2006, and come in black on gold, gold on black, gold on white, gold on red, gold on green and gold on blue (the bottom row of the picture below). Their stock is a bit stiffer than the Poker Edition09's, and the faces have jumbo indices (the Rug Backs are sometimes referred to as "Anglo Poker Jumbo Index"). 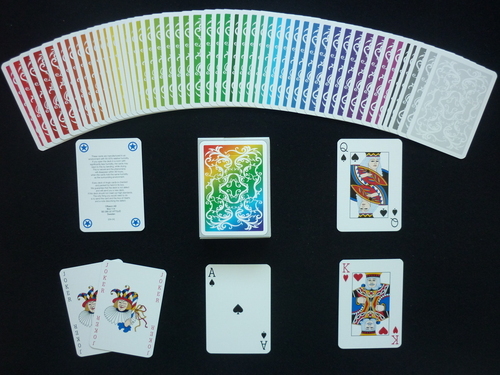 Poker Edition09 were introduced in April 2009, and come in white on black, black on white, white on red, red on white, purple on green and green on purple, as well as the Anglo Rainbow deck. They have standard size indices, and the white borders on the backs are slightly wider (4 mm) than on the Rug Backs. 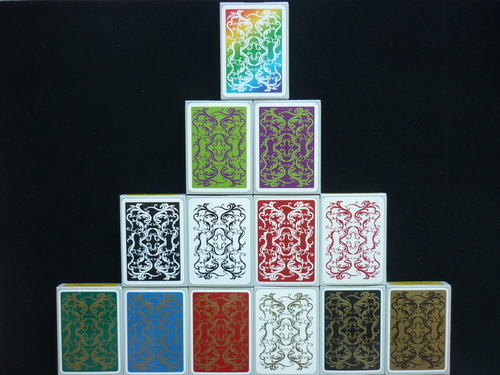 This is a less known back design, originally only found on the Anglo Giant deck. Comes in silver on blue and silver on red. There is also an Anglo Professional Poker deck (with a diamond-type back design), and several trick decks (depicted below is a gaff Poker Edition09 deck).